In the midst of the coverage this past week of the various pathologies of Muammar Gaddafi, the Wisconsin legislature and Charlie Sheen, some of the most ominous news was largely overlooked. 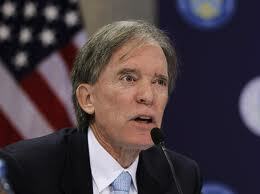 Pacific Investment Management Co. (Pimco) confirmed that billionaire Bill Gross, manager of the world’s largest bond fund, had completely eliminated U.S. Treasury Bonds from his flagship portfolio. About the same time, the bipartisan co-chairs of President Obama’s deficit reduction commission were telling a Senate Budget Committee hearing that the United States faces “the most predictable economic crisis in history” within just one to two years, unless drastic steps are taken to bring the government’s spending in line with its revenues. It’s hard to overstate the iconic status of U.S. Treasury Bonds as a safe haven for investors. For generations, the Treasury’s 30-year “long bond” was the talisman of the debt markets, although that role in recent years has been taken over by 10-year Treasurys. Think of Treasurys as the debt-market equivalent of the Dow, only more so. If fewer people are willing to lend us money, the more we’ll have to shell out in higher interest payments. And if bond buyers lose confidence in our ability to make good on that debt, things could get really ugly, really fast. Much more on this from Kevin Williamson here. As Sen. Tom Coburn (R., Okla.), who served on the deficit commission and supported its recommendations, pointed out at a press conference this week, the United States has, historically, paid an average of 6 percent interest on its debt. It currently pays about 2 percent. If rates were to return simply to that historical average, it would involve an increase to our overall interest bill of $640 billion — to be paid immediately. “An impossible situation,” in Coburn’s words. We’re quickly moving toward a situation where the combination of net interest payments and spending on entitlements (Medicare, Medicaid, Social Security, etc.) will absorb all of the government’s revenue. The Ponzi scheme known as Social Security probably is the easiest part of the equation to solve. But the Obama Administration, which made the problem much worse with its bloated and dishonest “Porkulus” legislation, has made clear that it does not think Social Security has a problem. In the early days of the Clinton Administration, Clintonista James Carville famously said, “I used to think if there was reincarnation, I wanted to come back as the president or the pope or a .400 baseball hitter. But now I want to come back as the bond market. You can intimidate everybody.” I fear a new generation of politicians is going to have to learn the hard way that the intimidation is appropriate. This entry was posted in Uncategorized and tagged Financial Meltdown, Stimulus by Kirk Petersen. Bookmark the permalink. Whatever else may be afoot, isn’t the move away from Treasuries an inevitable function of interest rates kept at historic lows by the Fed combined with renewed, if sluggish, economic growth that makes other investments more attractive and sheltering money in more secure government debt less so? It’s not just big players making this move as folks like me shift mutual fund mixes and stop buying treasury strips. I see this as relatively good news because when 10-year Treasuries hit 5 percent and the projected federal deficits have to be cranked up smother notch, Congressional Democrats will begin to come around to more serious deficit reduction. Cheap debt has given them a false sense of security on the deficit issue and emboldened them to demagogue about cuts. Since the 2011 proposed budget is one third higher than actual 2008 spending, it should be a piece of cake to cut it by 10 percent, or $400 billion. Sounds like you’re saying things need to get worse before they can get better. Probably true, but I don’t see how it qualifies as good news. And isn’t the Democratic response likely to be “more stimulus spending”?